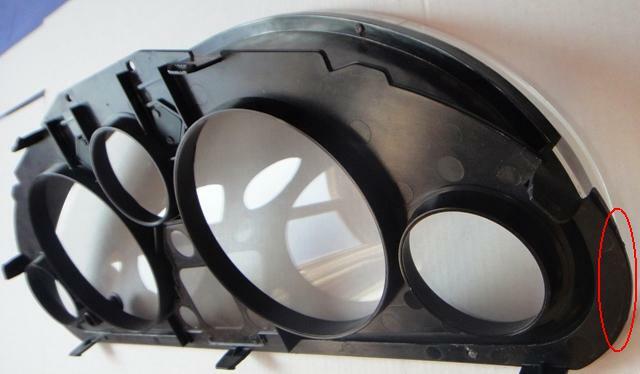 The installation of an instrument cluster cover in a MK1/NA MX5 requires the removal of the 1. binnacle, 2. instrument cluster and 3. it's glued glass. Until the second is straight forward just unbolting, the first and last require more attention. Before starting the removal start the car one more time and write down the idle revs with warm engine. You will need this later, to adjust the rev counter arrow. 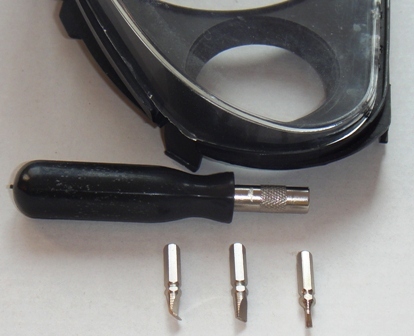 Your tools for removing the binnacle will be two wide screwdrivers. You want them wide, so they don't hurt the surface, when trying to bend/remove the binnacle. As a general rule, please keep in mind, that the binnacle plastic is old and crackly. It is best to do this in a warm day, warm garage or pre-heat the binnacle. 1. All covers around the steering column should be removed. 2. Push with the screwdrivers in the split between the bottom of the binnacle and the cockpit, left and right of the steering column. You will be able to feel two clips. They need to be pushed slightly to the back, in order the binnacle to be released from the cockpit and lift the bottom part of the binnacle. 3. Lift carefully the bottom edges of the binnacle, this way the side clips will detach. 4. Pull the binnacle to you, to detach the rear clips. You can now see the screws attaching the instrument cluster panel to the cockpit. Remove it by unscrewing them. Detach the cables at the back and unscrew the speedo cable. The glass with the black surround clips to the cluster panel. The clips need to be pushed down in order to release it. Now comes the tricky part, where you need to detach the body from the glass. Both are glued together. Please keep in mind that patience is essential. You need to be careful and gentle applying the force equally.If possible, try to heat up the part where you are working. Best to start is on the side. Try to lift by putting the screwdriver in the opened split, then equally lift, by opening on both sides. There are four pins on the glass that are glued to the body. You will most probably end up breaking them. Don't worry to crack the pins, instead of trying to save them, as they can potentially lead to a crack in the glass. It does not make any difference if they are broken or not, since you are going to glue the whole together. It might be faster at some moment, releasing the glass, sometime slower. Don't try to speed up the removal, keep the patience to the very end. As next, you need to remove the rings off the body, as the panel attaches behind them. They are plastic, that is glued with soft glue. Gently pulling them equally allows their removal, without being bend or destroyed. Please be gentle to it, keep it away from sharp objects not to get scratched and keep its surface clear during the installation. The stainless steel cover panel is tight fit to the dial holes and needs normally only to be held back to the body. You can do this only by gluing the rings on top of the panel cover. This way the body stays untouched and can be reused without problems without the cover again. Best to use is some high temperature resistant glue for the job, as it may get hot under direct sunlight. Using superglue is not a good idea, as it glues fast and does not allow lots of adjustments. Removing the rings one day could be impossible as well without destroying them. The left overs can be pulled out under the rings, after the glue dryies, without problems (as seen on the upper picture). The dial plates are unique for KMH and MPH cars. Their installation requires the removal of the arrows. 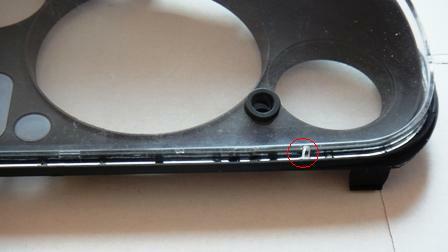 They themselfs are removed by unscrewing the two dial screws (each). To remove the arrows best works the two spoons trick. You need to lift the arrow with the tops of two spoons, that are supported on the dial screws. Once the arrows are off, it is quite easy to install the dials. For re-installing the speedo arrow you need to align the arrow at the 0mph/kmh position. 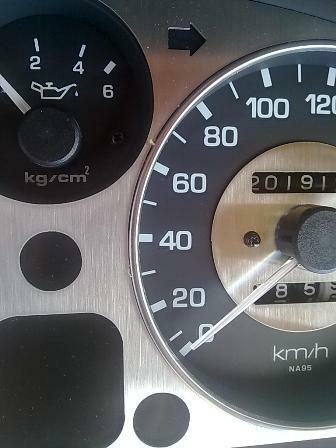 The rev counter screw should be attached after the instrument cluster is on the car and the car is idling with warm engine. Install it very gently pointing at you idle revs (the car had before removing the instrument cluster). It is usually 850 rpm in case you did not write them initially down. Now you can stop the car and finish the installation and gluing of the glass. Make sure there are no fingerprints or dust on the glass, as they will be very visible after reinstallation... and gluing the glass back. Insure there are no fingerprints on the stainless steel surfaces as well. It is time to treat yourself with a drive. The changing light reflections on the brushed stainless steel dash panel will put a smile on your face.